And I have certainly tried many many, many tricks to get myself to eat healthier. Right now, I’m trying to eat a salad or at least lots of greens at every meal. So, the people who spend their lives figuring out what we should eat are telling us to eat salad. I do pretty well at dinner and I now have eggs with spinach or a green smoothie at breakfast. But lunch is my weak point. I guess I thrive on accountability, and somehow being at home alone and going to the fridge for lunch too often ends up with me, a box of thin mints (not the right kind of green) and Netflix. I need a good hack. My latest solution? A salad shelf or a fridge salad bar: I’m dedicating a shelf of my refrigerator to salad fixings! 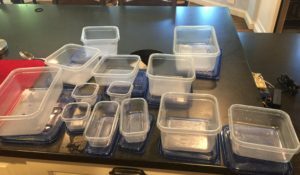 I measured the shelf in question and then got a variety of storage containers like these Ziploc Variety To Go Container, 7 Count. I found that I used two big ones for lettuces, rinsed, chopped into bite-sized pieces and ready to go. I also got bunch of veggies I like on salads to put in smaller containers: cooked beets, carrots, english cucumber, radishes and bell peppers. I even had a container of olives in the fridge that weren’t really moving, so I removed the pits, chopped them and put them in a small container. This is a rather long preparation process. I started before I was really hungry, but I wound up eating a leftover cheeseburger for lunch the day I prepped because I was too hungry to wait for my salad to be done. Then there is the matter of dressing. I have olive oil and a variety of vinegars on hand usually, so at first, I did a quick on-the-salad O&V combo. But I began to realize that the dressing really does make the salad. I have a few go-to recipes. There’s a Cosi copycat shallot viniagrette you can find here. And here’s a “Recipe” from Gwyneth’s latest book: equal parts white miso paste and raw almond butter (I think it’s a 3 to one miso to almond butter ratio if it’s roasted almond butter), thin it with hot water until it is the consistency you like. That’s it! I also like to use things like hummus or salsa as salad dressing. And a great trick that really gets me excited about lunch is to get some prepared tuna or salmon salad or even make a batch of your own. If you just plop that on top, it feels more special. Well, you already know day 1 I opted for a cheeseburger instead of a salad. Day 2: I dove in head first. Even though I was ravenous when I opened the fridge, I just grabbed the stack of salad fixings and made a good, and good for me, lunch. Day 3: Super busy, I didn’t eat lunch at all, unless you count the green smoothie I had at Jungle Juice with the kids after school. And really that’s more like lunch and a little dessert. Day 4: Back to the salad. The thing is, I was running out of some of the lettuce already. I may need more large containers for lettuce. It should last all week, right? Day 4: Settling into a routine. By now, I had my dressing set up. This was a day that I had some of my favorite salmon salad from Whole Foods, so I really looked forward to lunch. Day 5: Running on fumes for lettuce at this point. Which is great, because I’m eating so many greens. But I had to use some Kale, which I usually only eat cooked because I really hate raw kale. Takeaways: I will make a few tweaks for continued success. I’ll prep more lettuce, maybe three heads of romaine as well as a container of baby spinach or green leaf lettuce. I’ll also put other items for the salad in the fridge too, like nuts and seeds and maybe a little dried fruit. These are good for the smallest containers, because they should be used in moderation. I will also add more protein sources, like black beans and hard boiled eggs. In the end I did eat more salad. The salad shelf helped with my dinner salads as well, so even the days I didn’t have salad for lunch, I had it with dinner. (And I basically became Gwyneth Paltrow on the other days). Now I just have to cut out the Thin Mints . . . .